An highly skilled half forward, Barwick was recruited from East Launceston and after starting out at Fitzroy ended his career as a hero of the 1990 premiership. Barwick’s early years with Fitzroy saw him establish himself as a reliable small forward with an eye for the big sticks, slotting a career-high 47 in his final year in 1987. He was durable, too, playing more than 15 games in each of his four seasons with the Roys. Once he crossed to Collingwood, the barrel chested Barwick quickly set about becoming one of Leigh Matthews’ most trusted forward, kicking 27 in his first season at Victoria Park, highlighted by four against the Eagles in just his fourth game. He went at less than a goal a game in 1989 but roared back into life in 1990 when he kicked 36 goals from 23 games, including eight from four finals. Famously, it was Barwick who kicked what most Collingwood supporters knew as the sealer in the Grand Final, receiving a handball from Denis Banks before snapping truly in the shadows of the old Ponsford Stand, sparking wild celebrations throughout the ground and across the world. Injuries weren’t kind to Barwick the following year, restricting him to just nine games and none after round 12. 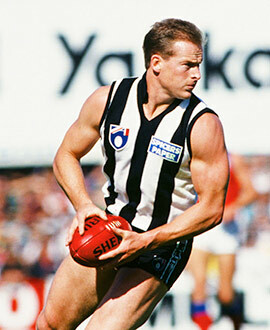 He retired with 147 senior games to his name, while he represented Victoria in 1987 and became a Collingwood Life Member in 2010.